Sasakawa USA’s Tabletop Exercise: Pacific Trident II, conducted in October 2018, built on the successes of Exercise: Pacific Trident to address U.S.-Japan, U.S.-ROK, and U.S.-Japan-ROK responses to signs of instability and illicit sanctions evasion activities in North Korea. While Pacific Trident addressed North Korean military provocations, Pacific Trident II focused on diplomatic engagements and assessed U.S.-Japan-ROK trilateral and bilateral responses to North Korean attempts to maintain a credible nuclear deterrent, evade sanctions to obtain money, and maintain regime stability. Pacific Trident II took place at the Lockheed Martin Center for Excellence, otherwise known as the “Lighthouse,” and included security, defense, and policy experts from the United States, South Korea, and Japan. The exercise involved seven teams—the United States, Japan, South Korea, China, Russia, North Korea, and the United Nations. The results of this exercise was published in a report for the public and for policymakers on December 6, 2018. “Testing the U.S.-Japan and U.S.-ROK Security Alliances” was released that day at a launch event at the Willard InterContinental Hotel in Washington, D.C.
Sasakawa USA hosted a panel discussion and report launch event to announce the release of its report “Testing the U.S.-Japan and U.S.-ROK Security Alliances: Tabletop Exercise Pacific Trident II. The event featured prominent exercise participants from the United States, Japan, and South Korea. 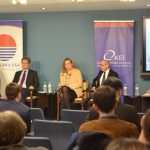 A video-recording of the event is available on the Sasakawa USA YouTube channel.